Alexander Calder produced his first moving sculptures, which Marcel Duchamp dubbed “mobiles,” in the early 1930s. Using cutout shapes reminiscent of natural forms (birds, fish, falling leaves), Calder created floating three-dimensional worlds in constant flux. 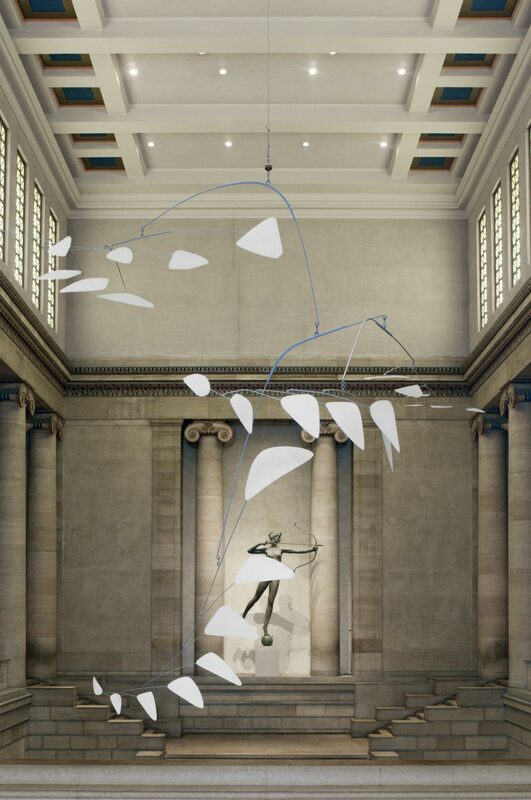 The large mobile Ghost installed in the Museum's Great Stair Hall was created to hang in the center of the Guggenheim Museum in New York for Calder’s exhibition there in 1964. Born in Philadelphia, Calder was third in a line of distinguished sculptors from this city. The Swann Fountain in Logan Circle was created in 1924 by his father, Alexander Stirling Calder (1870–1945). On top of City Hall is the thirty-six-foot-high statue of William Penn by Calder’s grandfather, Alexander Milne Calder (1846–1923), who also designed all the stone sculptural ornament for the City Hall building. Alexander Calder's mobiles are among the most often imitated works of art of the twentieth century and yet remain the most singular. Marcel Duchamp gave them their name, when Calder first began to make these constructions in the early 1930s. The mobiles reflect Calder's fascination with toys and his training as an engineer as well as his familiarity with the modern European art of Pablo Picasso, Piet Mondrian, and Joan Miró. Calder made Ghost for the central rotunda of the Solomon R. Guggenheim Museum in New York, on the occasion of an exhibition of his work in 1964. The white color of the sheet-metal panels, which gives the enormous mobile its name, probably was inspired by the all-white interior of Frank Lloyd Wright's Guggenheim building. Calder was delighted when the mobile was acquired by the Philadelphia Museum of Art, where it now hangs in the Great Stair Hall, with its view of the Logan Square fountain, made by his father, Alexander Stirling Calder, and the statue of William Penn atop City Hall, made by his grandfather Alexander Milne Calder. Ann Temkin, from Philadelphia Museum of Art: Handbook of the Collections (1995), p. 337. Alexander Calder's mobiles brought the unique element of motion into the art of the twentieth century. Marcel Duchamp gave them their name on a visit to the American artist's Paris studio in 1931, specifically in reference to a small standing work that was electrically activated. Calder soon applied the term to any sculpture that moves, whether powered manually, by motor, or by air currents. The forms of Calder's mobiles reflect his fascination with toys and his training as an engineer along with his early admiration for the imagery of Picasso, Mondrian, and Miró. The ubiquity of the mobile concept today, whether in the nursery or the corporate lobby, has obscured awareness of the radicalness Calder's invention in the context of the history of sculpture. Calder's early mobiles were domestically scaled, but by the 1950s they began to take on monumental proportions. The increase in size was a response to the demand for sculptures for public events or places, a result of the artist's great popularity as well as the building boom of postwar prosperity. Calder made Ghost to hang high above the central rotunda of the Solomon R. Guggenheim Museum in New York, on the occasion of an exhibition of his work in 1964. The white color of the sheet-metal panels, which gives the enormous mobile its name, probably was inspired by the all-white interior of Frank Lloyd Wright's five-year-old Guggenheim building. Ghost now animates the Philadelphia Museum's Great Stair Hall, which offers a clear view of the Swann Memorial Fountain in Logan Circle (1924) made by his father, Alexander Stirling Calder, and the statue of William Penn atop City Hall (1894) made by his grandfather Alexander Milne Calder. Twentieth Century Painting and Sculpture in the Philadelphia Museum of Art (2000), p. 105.